Riya (formerly Ojos) will be opening its doors to 10 or so lucky alpha testers tomorrow morning. I went by Riya’s offices today and met with the team to get a look at their product. According to Munjal Shah, Riya’s CEO, I am the first outsider to get a chance to bang on the live product. Given how hot Riya is right now, I consider that a huge honor. 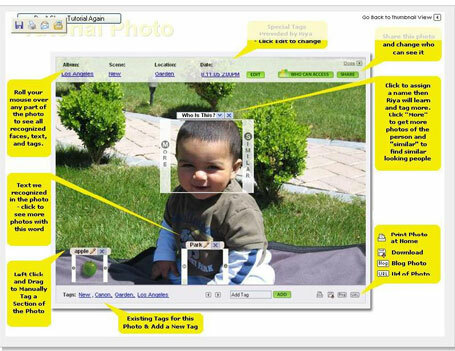 The process starts with registration and choosing a privacy setting on your pictures. You then download a client application that uploads photos you choose to include in Riya. The actual uploading takes a while – about 4 hours for each GB of photos. Instead of waiting around, Riya will email you when the process is complete. That’s when the fun starts. In my case about 400 pictures were uploaded. I was presented with a view of facial thumbnails of everyone in my photos. Riya asks that you begin to educate it by telling it who the people are…it then very quickly starts to auto-tag pictures with a surprising level of accuracy. It’s an easy step to allow friends to also tag and search your photos (if you choose), and even allow full public search. Linking these two features – massively automated tagging of everything in photos, with search, is compelling to say the least. The folks at Riya call it “tag locally, search globally”. Riya is going to be successful. They have real technology. 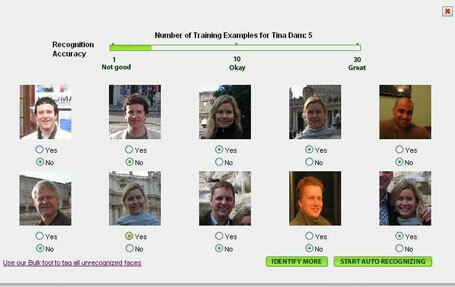 And, as people use it to tag photos, Riya will create a database of unique attributes of people. Once enough people start using the service, Riya will be able to auto-tag people’s names with less and less training by the user. At that point, why would anyone try a competing service? Riya will have technology (protected by patents) and an incredible network effect as well. Riya plans on having a destination site that will be free, and will OEM their service to other photo services. Sites like flickr can certainly try to duplicate Riya’s service, but unless they move very quickly Riya’s network effect Riya will be insurmountable. In fact, Riya could become so ubiquitous as to actually cause real privacy concerns. One question I asked the team today was – “what if you get so much data on people that I could take a picture of a crowd, upload it to Riya, and instantly have the names of every single person in the crowd?” Apparently, their technology is not that powerful – yet. 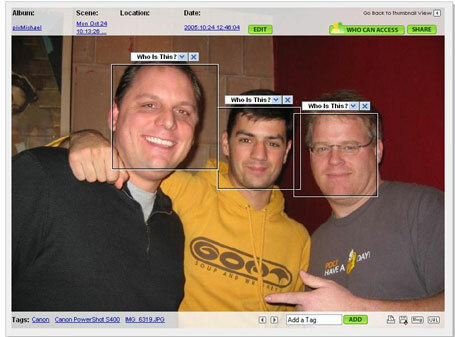 Riya’s ability to know who’s in a photo is largely based on who you are and the people you are connected to. To fully appreciate Riya you have to see it visually. I’ve posted a few screen shots below of my experience using it earlier today. Get in to the Riya alpha if you can. It’s going to be a popular service.